As the world becomes transformed with the advances of technology, so does the face of health care. 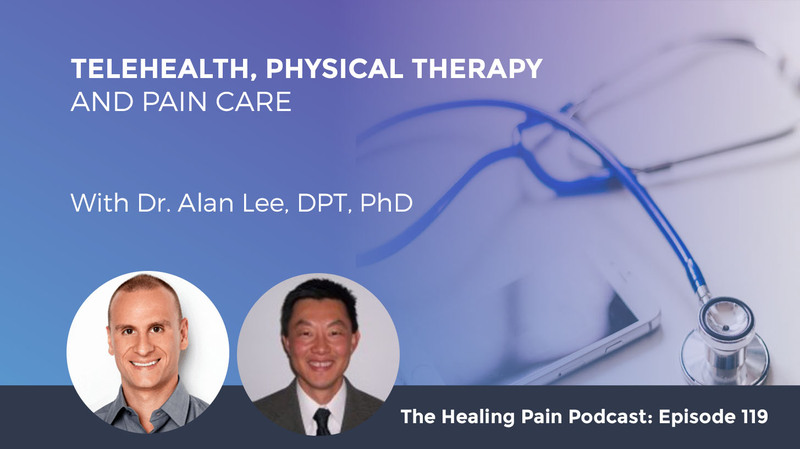 Tackling the side of pain care through physical therapy is Dr. Alan Lee, DPT, PhD who takes us into the emerging world of Telehealth or telephysical therapy. He is a professor of physical therapy at Mount Saint Mary’s University, Vice President of the Technology Special Interest Group at the American Physical Therapy Association, and the developer of telehealth resources for the American Physical Therapy Association, the American Telemedicine Association, among others. Dr. Alan discusses the potential benefits of telehealth to pain care as well as the policy payment and regulatory barriers that affect its widespread implementation. He also lays out some of the branches of telehealth from teleeducation to telerehabilitation. Rounding it up with further resources, Dr. Alan gives out a research article that will help you stay informed with the changes in telehealth. We have our expert guest, Dr. Alan Lee, who is a professor of physical therapy at Mount Saint Mary’s University and maintains a clinical practice at Scripps Mercy Hospital in San Diego, California. Alan is the Vice President of the Technology Special Interest Group at the American Physical Therapy Association and was awarded the American Physical Therapy Association’s Minority Faculty Development Scholarship Award and the Adopt-A-Doc Award from the Academy of Physical Therapy Education. Dr. Lee has developed telehealth resources for the American Physical Therapy Association, the American Telemedicine Association and works with the World Confederation of Physical Therapy on International Telehealth Physiotherapy Guidelines. Along with Dr. Todd Davenport and Ken Randall, Alan co-authored a paper in the Journal of Orthopedic and Sports Physical Therapy, which has been instrumental in educating physical therapists and other practitioners about telehealth, telemedicine, and telerehabilitation. Telehealth or telephysical therapy has the potential to transform the care of chronic pain, which is why I wanted to introduce Alan to all of you as a valuable resource. We will discuss the hype and excitement around telehealth, the potential benefits to its widespread implementation and the policy payment and regulatory barriers that could slow down the expansion of telehealth in pain care. If you’re a practitioner, Alan has also provided us with a free resource for you to download. This will help you stay informed about the rapid rollout and changes that are occurring in telehealth. All you have to do to download this is open up a browser in your computer and type in the URL, www.DrJoeTatta.com/119Download. If you can’t get to a computer, no worries. You can simply text the word 119Download to the number 44-222. Let’s begin and learn all about telehealth with Dr. Alan Lee. Alan, welcome to the Healing Pain Podcast. I’m pretty good. I’m glad to have you here. I’m excited because I was flipping through the Journal of Orthopedic and Sports Physical Therapy and your paper was there, which is called Telehealth Physical Therapy in Musculoskeletal Practice. It’s in the October edition of the Journal of Orthopedic and Sports Physical Therapy. I was excited to see it because it’s an exciting field. In many ways, I feel like even this podcast is in some way a version of telehealth. I’m glad to have you here. As we dive into this topic of telehealth, telemedicine and all the different telethings that we have these days, can you tell us about the different telethings that we have out there that are growing like telehealth and telerehab? My background was around telerehab at the VA system in Los Angeles, the West LA, VA with my mentor, Nancy Harada, back in 2006. As a hands-on physical therapist, when I saw that we could use technology to reach patients and older veterans and access, reducing travel and time to link with these patients and clients, I saw an opportunity for physical therapists who become part of a team to address varieties of different patient management as well as population management issues. Telehealth is the ability to use technology to work with patients in different clinical care. Telemedicine, those are physicians, doctors, psychiatrists, and others involved providing care via technology or telerehabilitation. We have professionals like PT, OT, speech therapist, call it telepractice and the ability to see patients via technology and other under that umbrella. It’s more of a telehealth model, which is any technology to see patients and clients. We’ve been around disaster relief like earthquakes and fires where patients can be accessed with providers to link them together, even specialists and generalists to work together towards health care. You’ve been in this area since 2006. It must have been a very new thing back then I would imagine. Telemedicine, it’s been around since the 1950s. Early on, they were using the television systems. Some of the earlier research came out of Nebraska where they were seeing prisoners in mental healthcare and prisoners being linked together instead of face-to-face in an office. That makes sense since the prisoners, not only do you need to transport them to mental health hospitals, but also the guards will need to come along in the ambulance ride. It reduced the cost as well as to link those patients with the television and mental health provider from the 1970s and ‘80s using the satellite ability to reach international settings with disaster relief happen in telemedicine. A large organization called the American Telemedicine Association came up more in the 1980s and ‘90s advocate for this type of digital practice. Telerehab was one of the six under Telemedicine Association where PT, OT, speech and even dieticians were providing care via technology. Let’s talk about physical therapists first because you and I are both PTs. Can any physical therapists participate in telehealth in any state? You, as a physical therapist, have a scope of practice and the ability to see patients through your licensure. Each therapist should check their license as well as their practice in that state in order to see if they can provide telehealth practice. They are around less than ten states that have some language around telehealth for physical therapists. It’s very specific on how you provide informed consent about protecting patients’ privacy and data security with business associate agreements. Again, identifying yourself as a physical therapist with the license. Either I knew the patient, show me your driver’s license. I know that that’s you to treat you. Also, if you need emergency care, I know you can call 911 but it might be a local therapist you can reach within the state since you and I live about 200 miles apart. You, as a therapist, need to know some of those intricacies and the detail as far as telehealth practice. Later on, we’ll talk about some resources that are out there in the article we mentioned. Through the Federation of State Boards, we have some resources that put each physical therapist to look in each state to see what’s going on. With 30 to 50 states moving quickly into this telemedicine, telehealth, you need to be aware of what’s happening. Also like a brick and mortar practice, you should also consult a lawyer to make that you are protecting your practice and mitigating the risk that could be there in your state. Not only your state but you think about another state. You live in New York. I live in California. You have interstate practice and how it’s dealt with. If I go to Arizona and I’m seeing a patient in California, I’m in Arizona, that interstate practice needs to be addressed and that’s happening. You have to know the practice acts in each state to provide telehealth. It sounds like it can be complex for a well-intentioned practitioner, whether you’re a PT or someone else because you have to research what’s happening in your state. If someone is 100 miles from you but in the same state, it could be one set of rules. If someone is five states away, it’s another set of rules. Is that correct? It’s very true. That’s similar for telemedicine and telenursing as well. Taking the lead from telemedicine, if you look at what they call the interstate compacts, the ability to use one license to reach other states, which are one license, that’s happening in medicine. There are about 30 states in the interstate compact. There are about 25 states in nursing with interstate compacts. In physical therapy, you should know, and we are very glad that there are interstate compact activities that are happening. We have about 21 states collaborating together to allow for using your home license to reach patients in other states with mutual agreements. You, as a physical therapist, have a scope of practice and the ability to see patients through your licensure. That’s called the interstate compact. Your license in California would allow you to, in essence, function in Kansas. That’s hypothetical. California and New York are not part of that contact yet. One of the activities that we can ask for and advocate for in our state chapters is to get involved. It’s more of those rural states, which are early adopters because they could see the benefits. That brings me to the next question as we talk about this whole telemedicine concept. Does private insurance and/or Medicare, which is government insurance, cover telemedicine? Those are the new ones, telemedicine, and telerehab. Since we’re both physical therapists, let’s put out that federally, physical therapists, occupational therapists and speech therapists are not telemedicine eligible providers under CMS. For Medicare program, we are not part of the telemedicine eligible provider. However, for telemedicine providers including physicians, surgeons, PAs, nurse practitioners, certified registered nurses, anesthetists, midwives, social workers, dieticians, nutritionists, psychologists, social workers, optometrists, dentists, marriage and family therapists, they are telemedicine providers. They can also work with Medicare. That’s one area of advocacy and physical therapy we need to address. There’s strong evidence with Medicaid programs that there’s a shortage of physical therapists. Medicaid programs statewide have a lot of telerehabilitation practice. We always want to create that distinction between telerehab and the other specialties. It’s always a shame to me how the rehab profession is often one of the last ones to be given the grants of approval, but somehow we wind up on the bottom. With the chronic pain epidemic, it’s a big mistake when CMS, Medicare, Medicaid, private insurers don’t say, “You can do telemedicine.” Medicare doesn’t cover it. Private Insurance, you have to pick up your card and call your particular insurance company because we all know there are thousands of different plans out there depending on the state you’re in. You have to inquire about that. Would you say that’s correct? That’s correct. The current activity and momentum around that and the private insurance is that they are allowing the physical therapist to participate in telehealth or telerehabilitation practice in those insurance programs, including Workman’s Comp and other large areas of our practice. The momentum is growing and it’s generating more activity. We have to be able to participate with others. When we’re talking about telerehab, in my mind, I’m going to work with a patient either via phone or maybe via a virtual format. I’m providing them with treatment. Is there a distinction between a teleeducation program versus a telerehabilitation or a telemedicine program? The first thing we should make is in what we call telehealth. Telemedicine and telerehab will be what you and I are going to show the real audio/video session and that’s what’s covered under Medicare. Again, another part would be the store and forward technology. We call that asynchronous telehealth which, for example, a radiographic image. A radiologist views it, makes a decision on that radiograph and sends that to another provider to implement that treatment plan. That’s what we cost during for asynchronous care. For telehealth, real audio/video, it’s the synchronous care that we are doing now. Phones and faxes are not part of that telehealth model. You can do that. You always text patients or they email you and you can respond, but that is not a reimbursable telehealth practice. When you’re providing teleeducation, you can use any medium you want. However, you are limited to some of the synchronous and asynchronous telehealth practice. It almost sounds like a practitioner can put up a teleeducation program and have it be asynchronous where the client is accessing prerecorded information. Somewhere there’s an exchange of value for payment there in some way. A lot of these HIPAA secure, HIPAA compliant telehealth portals will allow you to do that going forward, watch the patient’s videos or the patient themselves. They’re watching formatted videos or avatars. You can log in to a real live session that you are doing with audio and video to provide that supervision and feedback. One of the interesting studies that have come out of telerehab and chronic pain management was around chronic pain patients with low back pain in France. There was a lot of small sample from 29 individuals. They asked what type of technology you use with OT in terms of accessing and providing care for you in telerehab. What they found was that definitely what you wanted to do is if you want to do teleeducation or telehealth, make it very attractive to the users so that they would log on and see that exercise being very attracted to do. Not the dead bugs and what have you, which you and I are thinking about. Make it very attractive. The younger audience would prefer more visual and dynamic support and more challenging activities and exercises with feedback. The older adults in that small sample study prefer more ability or the possibility for supervision while the patient was performing the exercise. We, as providers, or even as industry leaders collaborating together to design telehealth chronic pain management, which thinks around what our end users would like. I was talking to some people and said, “As practitioners, we have things that we love and things that we think are great and innovative, but ultimately if the patient doesn’t want it or value it, it doesn’t matter too much.” You can’t force them into doing things. They have to see the value and want to do it. Is there a lot of research discussing telerehabilitation specifically for pain management syndromes? Ultimately, if the patient doesn’t want or value the type of care, then it doesn’t matter too much. There aren’t a lot of studies on telerehab and chronic pain. Around nine studies are what I’ve found in terms of a PubMed search. Around the topic of chronic low back pain was the majority of those studies. There are other studies looking at phantom limb pain with amputees. Several other case studies around MS as well as addressing breast cancer survivors. They’re all valid and I would say feasible telehealth or telerehab chronic pain management, patient population, addressing teleeducation, addressing self-management as well as some of your wonderful podcast around self-awareness that’s most ability to get the mental health components involved as a team. There are more opportunities for physical therapists to get involved. As physical therapists, we think, “How are we going to do telerehab?” We have to put our hands on people, but so much of what we do is education base. You can counsel on graded activity, on activity modification, on pacing, on aspects of health and wellness, nutrition. Even with things like the psychosocial aspects coming into our care with pain, we could even counsel on that and provide education on that, which is important. What about patient satisfaction? Do patients like this type of approach? Do they prefer to go into a clinic, sit down and fill out all the forms they usually fill out and sit with someone one-on-one or is this something that’s becoming more enticing to them? Dr. Atul Gawande at the New Yorker talked about their journey into epic and EMR in their health care system. At the end of the day, it came down to patient preference. We, as providers, do not lose sight of the face-to-face time and make sure that we keep our hands on. Even though we do use computer screens that we know in screen up the right patient for the right technology at the right time. We got to be mindful of that first of all, patient preference. There have been several early studies on patient satisfaction around telehealth. These were non-inferiority studies. Meaning the outcomes are no different than usual brick and mortar usual care. Most of these studies come out of the University of Queensland in Australia. My colleague, Trevor Russell, and their group, what they found was that patients are more open to telehealth as well as their non-hands on care because they took self-management like joint mobilization in terms of their total knees after their initial surgery, after they were shown what to do in the clinic and how to set up the technology at home. If the therapists are open to providing feedback via telehealth, they were more likely to do those exercises and adhere to them with high patient satisfaction. That’s been repeated with other studies. The university had a study with joints using a system out of San Diego. The reflection helps group which uses an avatar with AI or artificial intelligence with telehealth that studies showing cost savings, not only patient satisfaction. That’s what is going to take for us to address what you said with CMS and Medicare. Look at healthcare and the digital age and having physical therapist practice. To clarify, in some of those studies that you mentioned, it sounds like there’s almost a bit of a hybrid model where maybe the patient is coming in for one visit, maybe the initial evaluation, they’re getting started on the program. They’re establishing the initial plan. The rest of the plan of care and contact may be through in telehealth means. Most of those studies were designed as RCTs or either traditional brick and mortar physical therapy or in office, which is two doors down where the client wanted and the therapist was in the other two doors down telehealth. Those were the early studies. Another study believed that telehealth being delivered in patients’ homes versus that patient coming into the hospital, patient care for a total joint replacement. We’ve had several different types of RCTs where it’s been either as a hybrid approach, getting the technology started, and then separating out or has been more of usual care versus a telerehab approach. Tell us about some of the potential disadvantages of telehealth. Not every patient is appropriate for telehealth. It’s a tool for us to reach patients for access and also reduce issues around time and travel for our clients. We have to be mindful of informed consent. At the end of the day, patients have the right to come to the clinic. They should choose to come to the clinic or via telehealth or seen through technology. You as a practitioner have that responsibility to make sure the patient understands this moving forward. I think the other areas we talked about, data security and private business associate agreements need to be set for with the telehealth vendors, who have these compliance systems. How you best utilize the technology at the right time for those patients are important. You, as a provider, can you jump on Skype? If it is not so it should be like your brick and mortar office like you and I have to manage a very quiet environment. The lighting should be good enough where we can see the patient. When you do need to do the hands-on care that you would need to bring that patient into the clinic to do that hands-on care. In speech and OT at times like with speech care with patients with post-stroke that there are eHelpers on the other end. You can think about maybe using a caregiver or other to assist some of your examinations if that’s very simple or maybe guarding because they need that guarding or that supervision of exercise. We have to be mindful that not all patients could be seen in telehealth. We could do the hands-on work that we are the specialist for. Having someone on the other side to be there to help out or helps the patient encounter. What are your Spidey senses telling you about telerehabilitation and its role in our opioid epidemic that every professional organization has their eye on, especially the APTA and as we should? It’s been fascinating for me is tracking what the VA does. What they do is they use these simulation centers to train physicians and other practitioners with telemedicine. They fly them into an intensive simulation with telehealth and to address the chronic pain management. Maybe providing those frontline primary care individuals on other workflows. If they’re used to getting prescriptions, what else can you do? What are some of those other providers that you can work with, and maybe via telehealth? Can you reach a hands-on care physical therapist and see if this patient is more appropriate for that versus the usual care that they would do and reach some of those other specialists that you have on your podcast? Those are the opportunities that I see in telehealth is that we can interprofessionally work with those clients and patients. They lived through the future on what the patients might require for overall holistic approach versus being siloed. The technology allows us to do that a lot easier, with access and time that we couldn’t do in the past because of issues around scheduling, travel, and time as we talked about. At the end of the day, the patient has that preference in what therapists say. They get to choose what care they would like to get the best outcomes for. We have to work through human factors. That’s the main thing. We need to train the providers differently than the way you and I were trained to provide care, not only chronic pain management but an overall team approach when using technology but be mindful. Don’t forget the patient is in front of you, even though the computer screen is there. We have to have other ways to maybe design our workflows to address the patient’s needs. At the end of the day, the patient has that preference in what we’d say, the rule of thumb. They get to choose what care they would like to get the best outcomes for. That’s where I’m seeing some activities around the VA system bringing in provides to design some new workflows. Let them design the challenges they had within their local settings to address via technology. If I am a physical therapist and I’m working on my PhD or maybe I’m completing my DPT and I want to do something in the realm of telemedicine. If there was something within the PT realm that you think there are a couple of interesting areas you probably could study, do some research on whether it’s a med analysis. Whether it’s a pilot study or maybe an RCT, what suggestions do you have for people out there? I’ve always told providers, researchers, and educators, there are many areas. This field is wide open. We encourage all types of clinicians to participate with researchers. The stakeholders in the industry to participate with therapists and clinicians to do that translational research. Even students could get involved with current activities going around simulations and how they’re using simulations in their academic centers and introducing telehealth with that EMR interfaces. There are many opportunities. We’ve already addressed some of the low hanging fruit, early research was around musculoskeletal, total joint replacements and that’s being a push with other telehealth and telerehab providers in terms of their care. We’ve seen some activities around vestibular rehab and neurologic patients who can’t travel because of their own issues and concerns around dizziness and impairments. We’re seeing activity around that. The military, the VA has been very prominent in terms of care coordination and professional care. To get an advocacy course, getting the patient buy-in and also the insurers and federal level, we need to look at cost. A workforce is another area that when you could do the health policy and health services research around telehealth and how we implement our usual care or a hybrid approach to figure out what the best model is for our patient management. It’s exciting to see how this is moving. Hopefully, the states will get their act together and make it simple for providers. There’s not a lot of like what happens in this state, what happens in that state? What can I do? What can I not do? It just causes a slowdown of care. We have a slowdown of care enough when it comes to pain at least. Hopefully, work like yours and hopefully, some of the upcoming PhDs and DPTs will do some great work in this area. It’s been great chatting with you. I appreciate you having you on the podcast. Can you share with everyone your Twitter handle and how they can find a website where they can learn more about you? My Twitter handle is @AlanLeeDPT. There’s a research article that we discussed further collaboration with the first council in APTA and this was for the members and nonmembers of APTA. Nonmembers would call APTA and join the First Council Frontiers in Rehabilitation and Science and Technology Council. This council addresses not only telehealth but technology around robotics, genomics issues around regenerative medicine and rehabilitation. All of these areas of innovation, it’s under this council. Telehealth is part of this council. We are members and nonmembers collaborate together to have discussions, discourse, should we do this. We’re a hands-on. We move forward for telehealth, what do we advocate for? What’s the best research or what is the research area that we need to get into? Those are things that we can do online and for your patients and clients and other providers, please discuss what your needs are. We, as physical therapists, are moving telehealth forward but also address your concerns and needs. If you want to hop into PubMed and look at the Journal of Orthopedic and Sports Physical Therapy, Alan’s article is Telehealth Physical Therapy in Musculoskeletal Practice. It’s in the October 2018 edition of the JOPs. If you want to tweet out to him. His Twitter handle is @AlanLeeDPT. I want to thank Alan for being on the podcast. It’s a great interview and lots of exciting information that we’re working on here in telemedicine and telerehab. Share this out with your friends and family on Facebook, Twitter, and LinkedIn. Hop on over to DrJoeTatta.com/podcasts. In the upper right-hand corner, there’s a little box where you can enter your name and email address. Each week, I will send you the latest episodes right to your mailbox, absolutely free on lots of great topics like the one we had. Thanks for joining me and we’ll see you next week on the podcast. Dr. Alan C. Lee is a professor at Mount Saint Mary’s University while maintaining clinical practice at Scripps Mercy Hospital in San Diego with dual board-certifications in geriatrics and wound management. Alan is a lead telehealth member of the Frontiers in Rehabilitation Science and Technology (FiRST) Council and serves as the current Vice President of the technology SIG in APTA. He was awarded the APTA Minority Faculty Development Scholarship Award and Adopt-A-Doc Award from Academy of Physical Therapy Education. Dr. Lee has developed telehealth resources for APTA, American Telemedicine Association, and currently working with WCPT on international telehealth physiotherapy guidelines.